Cam here, I wanted to take a few minutes to share an interview I did with one of our sponsors: THEMUSEUM. THEMUSEUM and I have been connected for nearly three years now — ever since I founded MakerClub with my wife and son and THEMUSEUM offered to support us unconditionally. When I asked if they wanted to sponsor Maker Expo, run a joint booth at Discovery Square and team up for Kidspark they didn’t hesitate. Needless to say it’s been a great partnership. This interview is between myself and Vanessa Moniz, Teacher in Residence at THEMUSEUM. Cam: What prompted THEMUSEUM to take an interest in the maker movement? Vanessa: The original idea behind THEMUSEUM’s creation was to fill the community need to provide children with experiential learning opportunities that intersected science, technology, and art. Exploring, playing and making were, and still are, an integral part of the experiences and programs we offer our community. We’ve established great relationships with some incredibly talented makers who have helped us transform our space and deliver programs that have awed and inspired visitors of all ages. In the past few years, we’ve seen Kitchener shift into a community that encourages individuals to move away from being consumers to creators of the world around them. We’ve altered our programming to acknowledge this change, encouraging the act of making at different ages and abilities. A great example of this can be found in the monthly MakerClub for youth ages 6-15. This club enables children to explore STEM [Science, Technology, Engineering and Math] concepts through hands-on, skill-building activities. 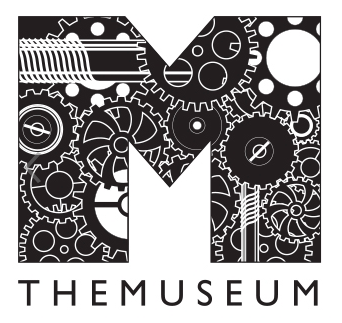 THEMUSEUM is also proud to announce the creation of a permanent makerspace which will open in 2016. Titled, The Underground Studio, this will be the first makerspace for young makers ages 6 to 17 in the region. We’ve raised $70,000 so far and are about half way there. The Underground Studio will really help us offer accessible STEM programs for youth that will equip them with the tools and knowledge to explore, imagine, and create their futures. Cam: Recently THEMUSEUM has been offering a considerable amount of programming outside of your main building. What prompted the change? Vanessa: One of our strategies is to take THEMUSEUM out of the museum. We really want to make ourselves more accessible to the broader community’s evolving needs. Waterloo Region is a diverse community with individuals and families from a wide range of economic and cultural backgrounds. We’re also a festival community which is a great way to let new residents know who we are and what we do. They can test us out and get to know the kind people behind the big building on King. In order to do this, we need to transcend our four walls and build lasting relationships and partnerships with our community members. Cam: What kinds of maker and STEM programming does THEMUSEUM offer on a regular basis? Vanessa: THEMUSEUM currently offers over 8 STEM based school programs that run throughout the year. We cover everything from space exploration in our onsite planetarium and the powers of light and sound, to energy conservation and biodiversity. This fall we have a new grade 6 program developed around using littleBits- tiny electronic modules with simple functions that snap together with magnets- to teach students the basic principles of circuits and electricity. We`ve actually recently become part of the littleBits chapter program, so look out for some exciting programs and public events in the upcoming months! In addition to our year round educational programs, we also have our monthly MakerClub sessions which happen every second Wednesday of the month. We also host free public events in partnership with the University of Waterloo Engineers in Action and other local originations who support STEM and the maker culture. Cam: Are you doing another stem week this year? Vanessa: Yes! From November 9th-11th we will be running our second annual STEM|Destination Imagination program. Last year, we connected over 200 Grade 6 students with hands-on Ontario Curriculum-based programming surrounding electricity, flight, and space. With the help of local tech professionals from ClearPath Robotics, Desire2Learn, and Structur3D Printing, we were able to inspire a continued interest in STEM through hands-on demonstrations of their innovative products and services. This year, we`re making it bigger and better! We`ve been reaching out to local STEM organizations in order to host a faire style program where students can have access to different companies and organizations, their technologies, ideas, and opportunities for experiential learning. We’re still looking for more technology professionals and organizations across Waterloo Region to help make this program awesome! If you are interested in participating or want to find out more information about STEM week, please let us know! You can e-mail me at vanessa.moniz@themuseum.ca or call 519-749-9387 ext. 244. Cam: Can you tell us more about the activity you are bringing to maker expo to share with everyone? 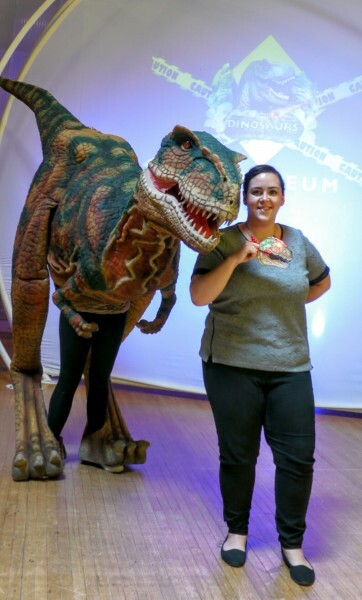 Vanessa: When I knew THEMUSEUM was taking part in Maker Expo, I really wanted to challenge myself to make something that demonstrated art and science and play, would be accessible to all abilities, and allow for individual creativity. With our current exhibition, Dinosaurs|The Edge of Extinction, and our much-loved juvenile T-rex, Maverick, in mind, I knew I wanted to create a dinosaur-something! Utilizing my love for drawing and design, I created a 3D dinosaur puppet template in Maverick’s image. 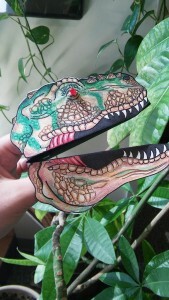 “Great!” I thought, I have this cool looking paper puppet, but now what? I wanted to make it come alive, but wasn’t quite sure how. This is when being connected to and part of a larger maker community is awesome. With the help of several maker minds I was inspired to turn my dinosaur into a paper circuit and learned how to make the circuitry work. 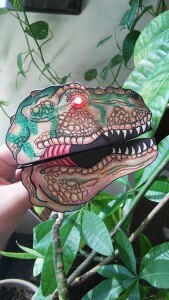 We’ll be teaching visitors how to use conductive copper tape, LEDs and a coin-battery to create their very own light-up, 3D paper puppet Dinosaur. It ended up being a really neat project that incorporates everything I hoped for- accessibility, integration of art and science, and individual expression. I’m very excited to share this with the community!